In our previous post on Martin Luther King, Jr Day, we highlighted the service projects and Sunday Suppers that our AmeriCorps Alums chapters were hosting throughout the country. 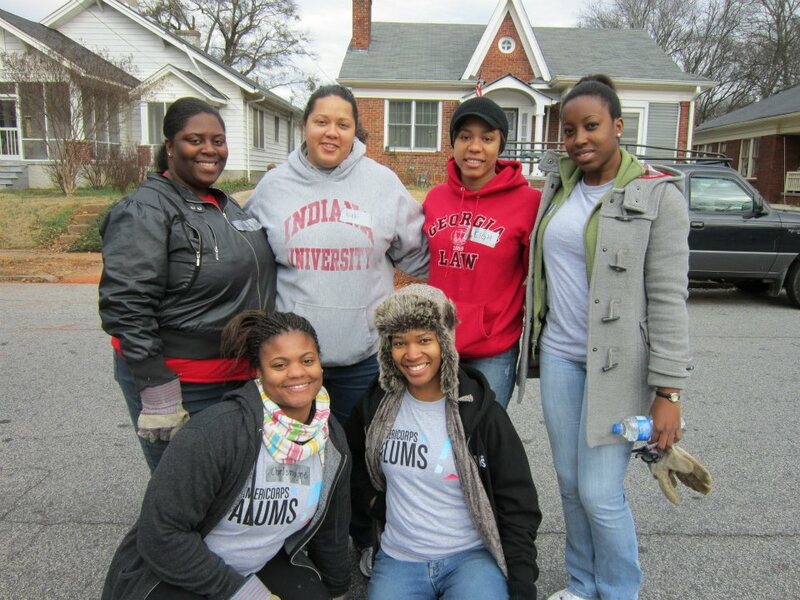 We are happy to report back on the successful MLK Day of Service that our Alums had; so happy that we’d shout it from the rooftops! Actually, blogging about it would be a whole lot easier and safer. The Metro ATL Alums Chapter met in South Decatur to serve with Decatur Preservation Alliance to help complete yard work and home repairs for senior citizens in the local neighborhood. Several volunteer and church groups also participated in the service event, and each organization was split off to work on 1-2 different homes. Over 20 Alums came out at 9:00 am on the chilly morning to help with landscaping and painting of two houses. The before and after effects of the work done were tremendous and we have a sidewalk full of whoppers to show for all the weeds and shrubbery we were able to clear! After our volunteer shift, we enjoyed brown bag lunches provided by the Girl Scouts of Decatur. One highlight was the surprises our Executive Director Ben Duda enjoyed in his brown bag lunch. CT AmeriCorps Alums and CT Public Allies teamed up with Neighborhood Housing Services, IRIS, New Haven’s Office of Sustainability, and The Yale Peabody Museum of Natural History to create none other than MLK Service Day! A large group of volunteers attended the event, which then split into teams and took care of several community projects with the aforementioned organizations, engaging hundreds of community members. We painted basements, weatherproofed hallways, spoke with local citizens about sustainability, and educated residents about “seed bombs” and creating green spaces. Then, we ate some generously donated pizza and salad, and there was even a breakdancer! One of the highlights of the day was the community collaboration. We served alongside a whole bunch of people: students from UNH, Dwight Hall at Yale, Hill House High School, AmeriCorps Alums, CT Public Allies, VISTA AmeriCorps Members, and Community Members. Finally, volunteers painted a conference room and stenciled a mural of the globe. The project received media coverage by WHO News and the Des Moines Register. 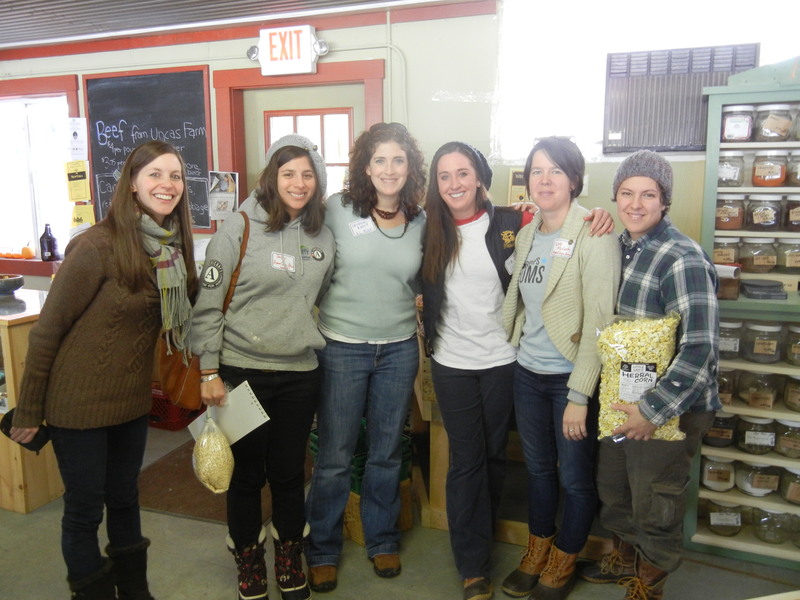 10 alums attended a Sunday Supper with FoodCorps at Sheepscot General Store on Uncas Farm in Whitefield, Maine. We listened to a presentation from a 4H Club and a farmer about their farm-to-fair project. Then we had a potluck lunch and completed our “I have a food dream…” illustrations, which were then displayed around the room. We donated money to Good Shepherd Food Bank and had several interesting conversations over our local lunch about issues surrounding food, community, the environment, class, and hunger. The NYC chapter of AmeriCorps Alums had 10 members assist with generationOn’s “Grow Involved on MLK Day” service project at a public school in East Harlem. They watched the documentary “Whatever it Takes” by Christopher Wong with nearly 600 kids, broke out into discussion groups, made scarves for a local homeless shelter, and created “Spread the Cheer” cards for our troops in the military. The team also hosted a Sunday Supper in Brooklyn where eight alums and supporters gathered to watch the broadcast of last year’s “Sunday Supper” and Dr. King’s famous speech on “The Drum Major Instinct,” where he said: “everybody can be great…because everybody can serve.” The group then discussed how to encourage and facilitate carrying on the mission of service in our daily lives and as an organized group of alums. The NYC chapter also partnered with the Sunset Park Community HealthCorps and Sunset Park Community Allies where a total of 28 members assisted the NYC Coalition Against Hunger’s “MLK Day Serve-a-Thon” at sites throughout NYC. How will you continue serving after MLK Day?